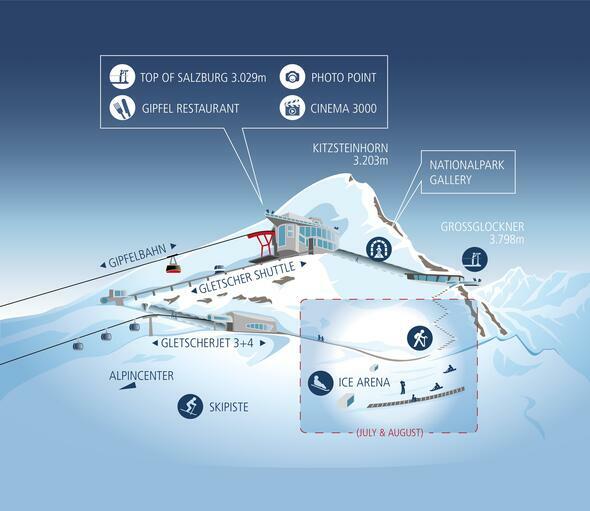 The Kitzsteinhorn summit station accommodates the Cinema 3000 – Austria's highest-situated cinema. The cascading arena offers comfortable seating and, once the film starts, you experience the virtual high alpine world of the Kitzsteinhorn and the Hohe Tauern National Park. The multi-award-winning film "Kitzsteinhorn - THE NATURE" was especially made for the Cinema 3000 and is presented on an eight metres wide screen. The film shows fascinating images of the powerful beauty of the high alpine mountain world throughout the year. Freeriders glide elegantly through natural powder snow on the wide glacier slopes of the Kitzsteinhorn while the golden eagle majestically circles the summit.